For over 12 years the sound of Cascada de Flores (Arwen Lawrence, Sabra Weber & Jorge Liceaga) has echoed the golden radio age of Latin America, where jazzy bolero and earthy traditions from the countryside were joyously juxtaposed. Tonight they present Radio Flor—a musical loveletter to the early days of Latin American radio, when songs were king and a melody grabbed your heart for a lifetime. Whether broadcasting from station XEW in Mexico City 1929, or RCH of Habana, Cuba 1945, the sultry songs of Radio Flor tell the story of a bygone era. Musical vignettes in Spanish and English feature heart-wrenching bolero, raucous Cuban guaracha, or earthy Mexican son, set in an old-time radio show format somewhere between 1929-1959. Joanne Hoover, music critic emeritus of the Washington Post, says of Radio Flor, "One song and you feel as if you're in a smoke-filled café in France, the next one carries you to a small village in the Mexican countryside. They do sophisticated improvisations with a jazzy charge that makes your whole body vibrate, then turn around and perform a canción about love that brings you close to tears." Arwen sings, dances, and plays guitar, jarana jarocha, vihuela, and claves. Jorge plays lead guitar, tres, guitarra de son, and accordion. Sabra sings and plays flute, marimbol, maracas, and donkey jaw. 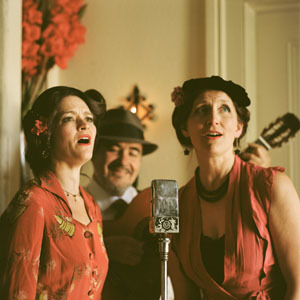 Arwen and Sabra's celebrated vocal duet, reminiscent of the vocal hermanas (sisters) of yesteryear mixes with the stylings of guitarist Jorge, who carries them with unique expertise, drawing from his mixed heritage of Bibriesca, syncopated Yucatecan bolero and the communicative flamenco art tradition. They will be joined by the amazing Saul Sierra-Alonso (bass) and Brian Rice (percussion). Together, they move through the radio dial of yesteryear, when programs exploded with thrilling diversity. After their journey back in time is complete, Cascada De Flores will perform a short set of favorites from their rich repertoire of folkloric songs of Mexico and Cuba. Don't miss this amazing musical-theater experience of heart-wrenching song, mysterious radio-novelas and spicy jingles!